José María Aznar was born in Madrid in 1953. He is married to Ana Botella, with whom he has three children. He graduated in law and qualified as an Inspector of State Finances in 1975. He was Distinguished Scholar at the University of Georgetown from 2004 to 2011. He is Executive President of FAES (The Foundation for Social Studies and Analysis); Member of the Board of Directors of New News Corp; Distinguished Fellow of the School of Advanced International Studies (SAIS) at Johns Hopkins University; Member of the International Advisory Board of Barrick Gold Corporation; Chairman of the Friends of Israel Initiative; Member of the International Advisory Board of the Atlantic Council of the United States and Senior Advisor to the Global Board of DLA Piper. He is the Honorary Chairman of the Partido Popular. 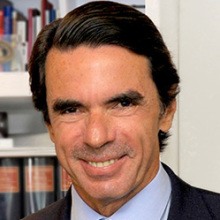 José María Aznar began his political career in 1979. He was elected Head of the Regional Government of Castile-Leon between 1987 and 1989. In 1989 he was chosen as the Partido Popular’s candidate for President in the general elections of 1989. The following year he was elected Chairman of the Party. Between 1989 and 1996 he was the Leader of the Opposition. He became President of Spain in 1996, following the electoral victory of the Partido Popular. With the party’s subsequent electoral victory in the year 2000, this time with an absolute majority, he led the country again until the elections of 2004, when he voluntarily chose not to run for office again. Throughout his two terms as Prime Minister of the Government he led an important process of economic and social reform. One of José María Aznar’s most serious concerns is the battle against terrorism. He is a strong supporter of the Atlantic Relationship and the European Union’s commitment to freedoms and economic reform. He has written several books and has been awarded honorary doctorates by different Universities, as the Florida International University (1998) and Bar- Ilan University in Israel.